Building on its wildly successful designer collaboration model, H&M is partnering with an artist for its next big retail event. The fast fashion brand has joined forces with Jeff Koons ahead of his highly-anticipated retrospective, which opens at the Whitney Museum on June 27. H&M has signed on as a sponsor of the exhibit. To coincide with the opening, WWD reports that the clothing retailer will transform its biggest store, located on 5th Avenue and 48th Street in Manhattan, in the guise of an art museum. H&M plans to plaster the facade with a blow-up photograph of Koons' famous Yellow Balloon Dog sculpture, superimposed with the message, "Fashion Loves Art." 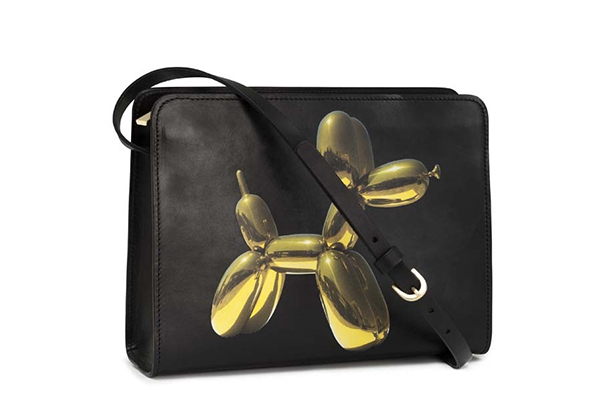 The Yellow Balloon Dog also appears on a limited-edition handbag (pictured above), which will retail for $49.95 in select U.S. markets and online. An orange version of the Balloon Dog sculpture sold for $58.4M at Christies last November.